NATA would like to congratulate member, Curaçao Air Terminal Services (CATS) for recently becoming IS-BAH Registered! Click here to read about CATS’ accomplishment. Check out the FBO / Ground Handling Status Map to see what other service facilities are Safety 1st Qualified and/or IS-BAH registered. To find out more about the IS-BAH program, please visit http://nata.aero/Safety-1st.aspx. It’s been two weeks since we’ve returned from the NBAA Schedulers & Dispatchers Conference in New Orleans – has it been that long? The emails and messages are finally caught up (until tomorrow) and so now we have time to send a thank you! It was wonderful to see so many NATA Safety 1st participants at S&D and thank you for “showing off” by displaying your Safety 1st Counter Card! Delivering those cards is one of the fun parts of our jobs; we either get to meet our valued customers for the first time or reconnect with those that we haven’t seen since the last S&D. It’s great to put faces to all of those names! 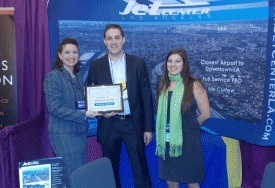 A special thanks to the folks at Los Angeles Jet Center for welcoming us to their booth to present them their official NATA Ground Audit Registry certificate! Thank you all for your continued support of the NATA Safety 1st program! Until we meet again (next year in San Jose), we look forward to speaking with you on the phone and helping you with your training needs.